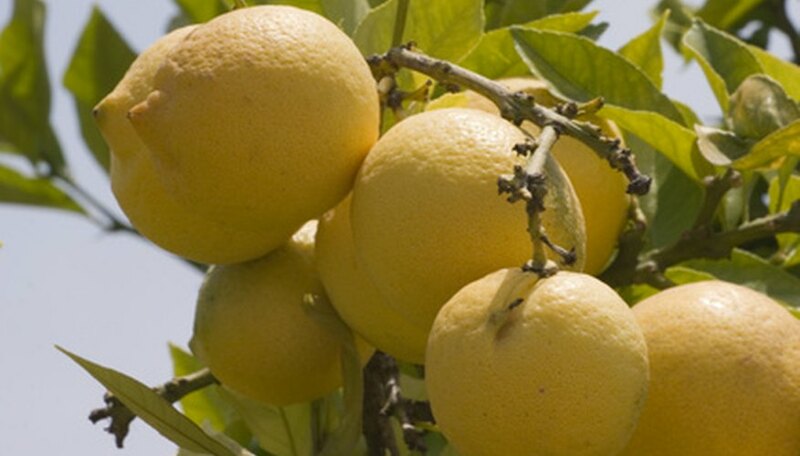 As you care for your lemon trees, know how to feed citrus, as this is an essential process. This task is often confusing because it is easy to over or underfeed your tree and inadvertently cause adverse reactions. For example, too little fertilizer makes trees struggle to grow because the nutritional needs are not being met, while too many nutrients makes the tree produce too much foliage without the fruit. Using a few key guidelines, feed your lemon trees the right way so they continue to thrive. Use an ammonium sulfate fertilizer with a nitrogen, phosphorous and potassium (NPK) rating of 21-0-0 to feed your lemon tree. This quantity you use depends on how many years the tree has been in the ground. Use 1/2 lb. for newly planted trees less than a year old, 1 1/3 lbs. for trees between one and two years, 2 2/3 lbs. for trees two to three years old, 3 1/2 lbs. for trees three to four years old, 4.75 lbs. for trees four to five years old, 6 lbs. for trees five to six years old and 7.25 lbs. for trees older than six years. Note that this measurement is the total amount you give your lemon tree each year and not the amount you give per feeding. Divide the targeted pounds of ammonium sulfate into three equal parts. Feed lemon trees three times a year in January or February, April or May, and August or September. Spread one third of the fertilizer around the base of your lemon tree during these months. Rake the fertilizer into the top layer of soil. Water the fertilized area to ensure that the nutrients stay put. Additionally, water your tree every couple of weeks, as lemons benefit from consistent, deep soakings. Use a moisture meter if you need help determining when your lemon has enough of the water. Continue to feed your lemon tree during the monthly schedule listed in Step 2. The first number in an NPK rating stands for the amount of nitrogen in the solution. The ammonium sulfate rating of 21-0-0 means this fertilizer has 21 percent nitrogen.